The basic components of dental extraction forceps are the handle, hinge, and beaks (Fig, 6-42). The handles are usually of adequate size to be handled comfortably and deliver sufficientpressure and leverage to remove the required tooth. The handles have a serrated surface to allow a positive grip and prevent slippage. 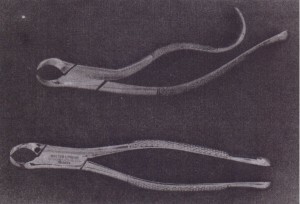 The handles of the forceps arc held differently, depending on the position of the tooth to he removed. Maxillary forceps are held with the palm underneath the forceps so that the beak is directed in a superior direction (Fig. 6-43). The forceps used for removal of mandibular teeth are held with the palm on top of the forceps so that the beak is pointed down toward the teeth (Fig. 6-4·l). 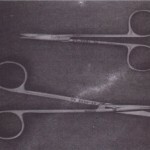 The handles of the forceps are usually straight but may be curved. This provides the operator with a sense of “better fit” (Fig. 6-45). 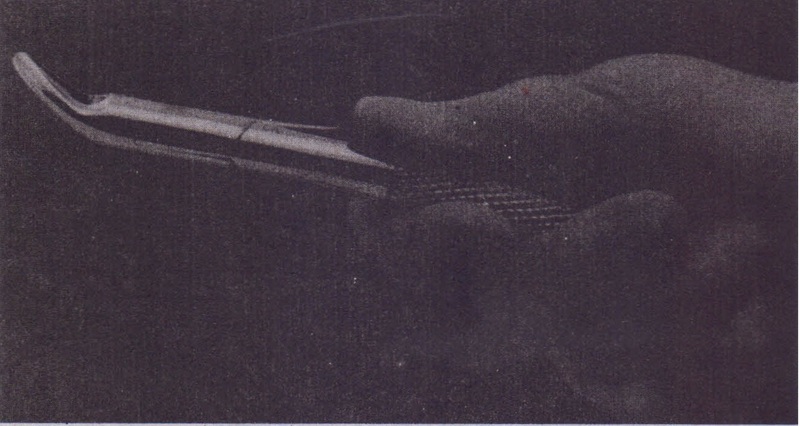 The’ hinge’ of the forceps, like the shank of the elevator, is merely a mechanism for connecting the handle to the beak. 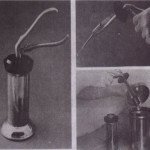 The hinge transfers and concentrates the force applied to the handles to the beak. 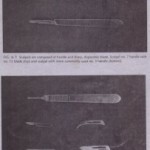 One distinct difference in styles does exist The usual American type of forceps has a hinge in a horizontal direction and is used as has been described (see Figs. 6-42 and 6-43). The English preference is for a vertical hinge and corresponding vertically positioned handle (Fig. 6-46, A). Thus the English style handle and hinge are used with the hand held in a vertical direction as opposed to a horizontal direction (Fig. 6-46, B). The beaks of the extraction forceps are the source of the greatest variation among’ forceps. The beak is designed to adapt to the tooth root at the junction of the crown and root. It is important to remember that the beaks of the forceps are designed to be adapted to the rout structure of the tooth and not to the crown of the tooth. In a sense then, different beaks are designed for single rooted teeth, two-rooted teeth, and three-rooted teeth. The design variation is such that the tips of the beaks will adapt closely to the various root formations, decreasing the chance for root fracture. The more closely the beak of the forceps adapts to the tooth-roots, the more efficient will be the extraction and the less chance for untoward complications. A final design variation is in the width of the beak some forceps are narrow, because their primary use is to remove narrow teeth, such as incisor teeth. Other forceps are somewhat broader, because the teeth they are designed to remove are substantially wider, such as lower molar teeth. 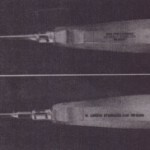 Forceps designed to remove a lower incisorcan be used to remove a lower molar, but the beaks are so narrow that they will be inefficient for that pplication.Similarly the broader molar forceps would not adapt to the narrow space allowed by the narrow lower incisor and therefore could not be used in that situation. The beaks of the forceps are angled so that they can be placed parallel to the long axis of the tooth, with the handle in a comfortable Position. Therefore the beaks Of maxillary forceps are’ usually parallel to the handles .. Maxillary ‘molar forceps are offset in a bayonet fashion to allow the operator to comfortably reach the posterior aspect of the mouth and yet keep the beaks parallel to the long axis of the tooth. The beak of mandibular.forceps is usually set perpendicular to the handles, which allows the surgeon to. reach the lower teeth and maintain a comfortable, controlled position. Forceps used to remove maxillary teeth are held with palm under handle. A, Forceps used to remove mandibular teeth are held with palm on top of forceps.